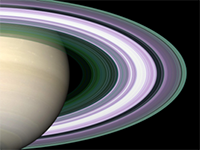 A profile of the rings of Saturn derived from radio occultation at three wavelengths, corresponding to frequencies of three radios on the Cassini spacecraft: S-band (red), X-band (green) and Ka-band (blue). The signal extinction is visible in this image, from which the optical thickness and particle size distribution can be inferred. The profile is superimposed on an image of the rings generated from radio occultation data (credit: E. A. Marouf, SJSU). 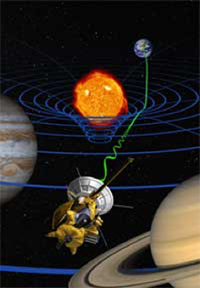 Radio links between spacecraft and Earth are utilized to examine changes in the characteristics of electromagnetic waves, such as their phase/frequency, amplitude, radio spectrum, or polarization, to investigate many aspects of planetary science, space physics and fundamental physics. A planetary body’s atmospheric composition, temperature, pressure, and ionospheric composition can be determined by tracking a spacecraft as it passes behind it. As a spacecraft’s signal propagates through a ring system, it can reveal information on the particle size and distribution of the rings. 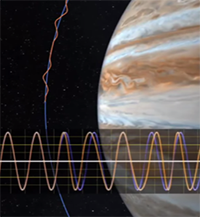 Careful tracking of the Doppler shift of a spacecraft's radio transmissions yields information about planetary gravitational fields, shapes, masses, and ephemerides. This technique uses a spacecraft's antenna to point at a specific point on a planetary body (called the specular reflection point). The the reflected signal is received at the Deep Space Network, and is analyzed to reveal details about the roughness and composition of the surface. During the descent of a probe into a planetary atmosphere, the wind affects its trajectory, causing a Doppler shift on the transmitted signal. This effect can be detected by the Deep Space Network on Earth. 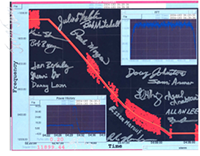 Analysis of the received data reveals the wind speed and direction in the atmosphere at the probe's location. 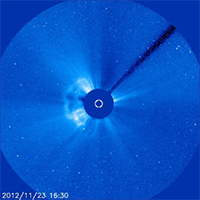 As a spacecraft passes near the Sun during solar conjunction, the transmitted signal is altered by charged particles emitted from the solar corona. An analysis of electron content in the received signal can help characterize the solar corona. Some spacecraft have radio equipment sensitive enough to enable the search for gravitational waves. This data can provide validation of the Theory of Relativity through estimation of post-Newtonian parameters using relativistic time-delay. 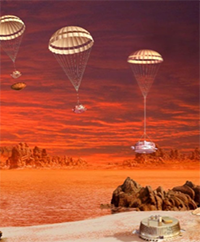 At JPL, the Raio Science Systems Group also supports mission critical events, such as Entry, Descent, and Landing (EDL), orbit insertion, and spacecraft launch and recovery, looking for changes in the signal transmitted to determine the state of the spacecraft.